A spokesperson for the Minister said the inquiry will most likely be run by ‘two respected experts with experience in the commercial and public broadcasting sectors; one person from each’. The intention is that the inquiry be broad and open to receive public submissions. Back in August, the Government secured One Nation votes for the media reform package (now passed into law) by agreeing to hold an inquiry, part of which included forcing SBS to publish the salaries of staff earning more than $200,000 per annum. SBS has been doing that for years in a de-identified form. Recently, the Communications Minister, Senator Mitch Fifield, wrote to SBS Chair, Dr Bülent Hass Dellal AO, requesting that SBS publish the names of the high salaried individuals. Save Our SBS was told that if SBS refuse the Minister’s request to name names, the Government will legislate compelling the broadcaster do so. But last week the Senate passed a motion that it will not support such legislation. 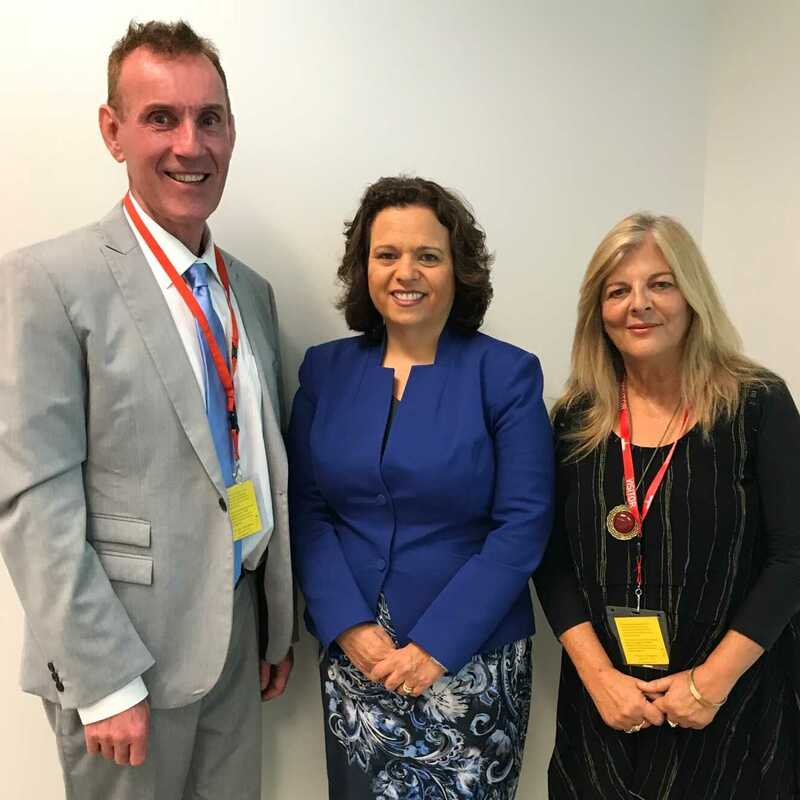 The Shadow Communications Minister, Michelle Rowland MP (pictured with Save Our SBS President Steve Aujard and Committee member Anne Tsoulis) reiterated Labor opposed the naming of individuals in publishing SBS salaries. During the week, Save Our SBS met politicians from Government, Opposition, minor parties and most of the crossbenches in the Senate and House of Representatives. Much more was discussed than the ‘salaries’ issue. The politicians were generally supportive of SBS but felt it needed to cease travelling down the commercial path to the extent it had and adhere more closely to its charter. No-one spoke favourably of in-program advertising. Few Australian programs and the lack of in-language (languages other than English) content – on SBS television – was discussed at length. SBS seeks full funding for a much higher proportion of Australian content than it currently achieves. The idea of the main SBS channel increasing its Australian content – telling stories about Australian communities – and another SBS channel broadcasting in-language programs without advertising disruption, was looked upon favourably. 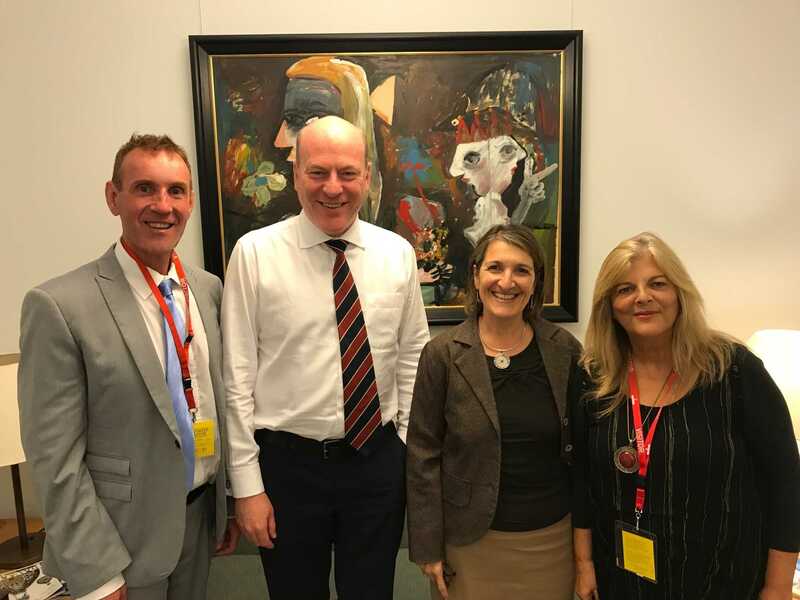 Included in the dozen or so meetings, Save Our SBS met with the convenors of the Parliamentary Friends of SBS, Mr Trent Zimmerman (Lib) MP, and Ms Maria Vamvakinou (ALP) MP, (both pictured with Mr Aujard and Ms Tsoulis from Save Our SBS). Away from Parliament House but still in Canberra, Mr Aujard and Ms Tsoulis also met with the Federation of Ethnic Communities Councils of Australia. It was noted that although the senior program and decision makers within SBS were once mainly from non-Anglo backgrounds, that is no longer the case.